It takes the right paint applicators to get the biggest payback from your investment in high-quality paint. For a consistent, long-lasting finish, you need to apply paint and coatings with high-quality application equipment. 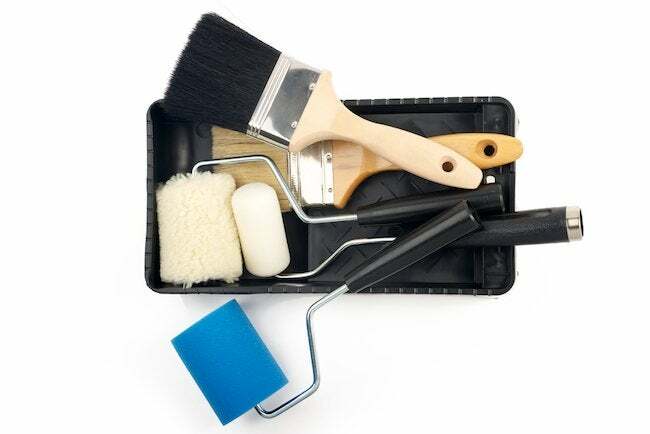 Better-quality brushes, rollers, and applicators tend to apply a thicker, more uniform, longer-lasting coat of paint than paint applied with cheap equipment. Top-quality equipment also speeds up and simplifies your work. The tools you require will depend on the type of project you are doing and the type of paint you are applying. Still, some simple guidelines hold true for any quality paint job. There are two general categories of paintbrush: those made of natural-hair bristles and those made with synthetic materials, such as nylon or polyester. If you are working with alkyd or oil-based paints and coatings, you can use either natural bristle brushes or synthetic bristle brushes. However, high-quality natural bristle brushes work best when applying enamels or any topcoat. When applying any type of latex coating, use only brushes with synthetic bristles. No matter how much water they are exposed to, they hold their shape and maintain proper stiffness. Top quality polyester brushes are well worth the initial cost. When properly cleaned and stored, they will continue to apply paint smoothly and uniformly for years to come. Whether you are doing interior or exterior painting, make sure that you match the size and shape of your brushes to the job at hand. Use large brushes to cover large surfaces and small brushes to cover small areas. To do most jobs properly, take the time to match the brush to the job. Match the right brush to the job to get the best paint application possible. For large exterior surfaces, use a 4″-wide (100mm) flat brush with a thickness of 3/4″ to 1″ (25mm to 3mm). To cut in at the corners of exterior and interior walls, use a 2″-wide (50mm) brush with tapered edges. For exterior and interior woodwork and molding, use brushes between 1″ (30mm) and 2 1/2″ (60mm) wide. For precise painting of exterior and interior window frames and trim, use angled sash brushes between 1″ (30mm) and 2 1/2″ (60mm) wide. • measure at least half as long as the width of the brush. (For example, the bristles on a 2″ wide (50mm) brush should be 3″ (75mm) or more in length). In addition, tug on the bristles before you purchase a brush. If more than one or two bristles can be pulled out, the brush is probably poorly constructed. Finally, make sure the brush feels comfortable in your hand. If a brush is well made and well cared for, it will last for years, so make sure you can use it comfortably. Rollers are faster and easier to use than paintbrushes, especially when painting walls, ceilings, and other large, flat areas. They are also excellent for use on tough exterior surfaces like stucco and concrete. However, rollers are difficult to work with in small or narrow spaces, so you’ll probably need to buy several different sizes of rollers, and one or more paintbrushes. As with brushes, when you are applying latex paints, make sure you use roller covers made with a synthetic “nap,” or fiber surface. When applying alkyd or oil-based paints, you can use either synthetic or natural fiber covers. As with brushes, it is wise to purchase better-quality roller covers, even though they may cost more initially. High-quality roller covers apply paint more easily and are less likely to leave nap fibers on the painted surface. While price is a good indicator of quality, you can also test the quality of a roller cover by squeezing it. A high-quality cover will quickly return to its original shape. Also be sure the roller cover has no obvious seams, since these tend to leave streaks when you apply the paint. Standard roller widths are 7 1/2″ and 9″ (190mm and 240mm). The 9″ (240mm) size is suitable for most interior wall and ceiling jobs. Mini-rollers, about 3″ (75mm) wide, are convenient for painting trim and narrow areas. Paint pads can help you apply paint in hard-to-reach places, including those where neither brushes nor rollers will fit. While they are not recommended for applying paint to entire walls (since lap marks may result), paint pads are especially helpful when cutting in corners and painting areas where walls and ceilings meet. Most paint pads are made of foam or mohair, and can be used to apply both latex and oil-based or alkyd paints. In most cases, the pads can be replaced when worn or damaged. For quick coverage of large surface areas, it is tough to beat power-spraying equipment. While sprayers may use more paint than other types of applicators, the ease and convenience they offer make them ideal for large jobs. Conventional sprayers use compressed air as the pressurizing agent to deliver the paint. Airless sprayers pump the paint directly. Achieving proper coverage with conventional sprayers can be tricky business, but accomplished do-it-yourselfers can get good results with airless sprayers. Hand-carried electric airless sprayers are a good choice for interior painting; larger, wheel-around gasoline or electric units are better suited for extensive exterior work. As with all power equipment, be sure to follow the manufacturer’s instructions for setup and operation. Most important, never point an airless sprayer at any person or pet, because the pressure of the spray is strong enough to inject paint into the bloodstream, which can be harmful or even fatal. Finally, when doing exterior painting, avoid working on windy days.